Not a fan of dead space in your new home? Neither are we. It’s important to utilize every space to its full potential, whether it’s a townhome or single family home. If you’ve been inspired by Marie Kondo’s tidiness, you’ll appreciate the level of organization and comfort you feel when you maximize your space in a Rockhaven home. Sunrooms are the perfect home escape. They offer a casual place to sit when your living room may be occupied. If you want to sit and read in a tranquil area, a comfy couch in front of the window, as seen above on the left at Reserve at City Center, is the perfect way to enjoy your book in peace. This extra space also presents an opportunity to express your design individuality. Your sunroom can house an entirely different decor style than the rest of your home. A pop of color or pattern gives your sunroom a fun, welcoming feel, and you can enjoy showing your personality in each accent piece. 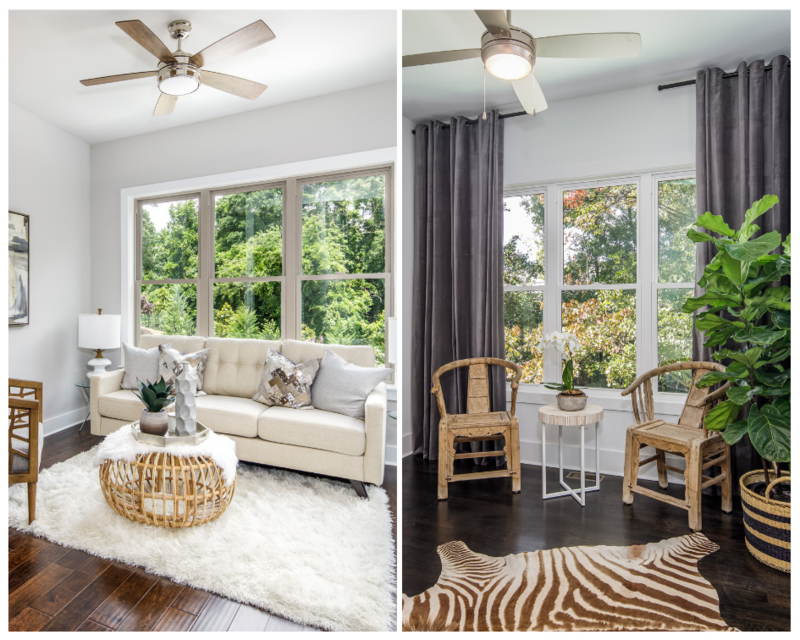 Fill it with original pieces of furniture, like the above right at 28th at Brookwood, and let your sunroom be a conversation starter! 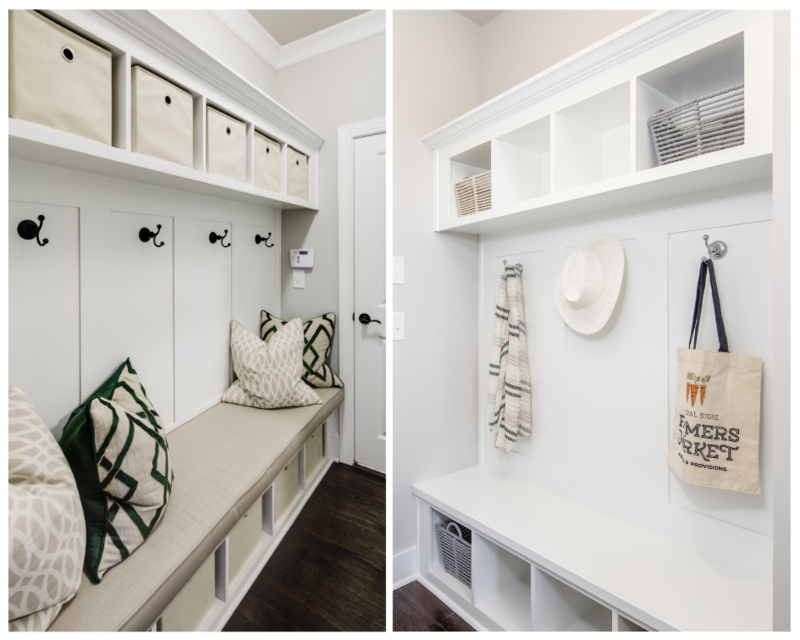 Your mudroom can gather clutter quickly, but with built-in storage, you can leave your worries at the door. Kick off your shoes and hang your hat on your convenient hall tree! Add a seat cushion like the one seen at Park Chase. So that, you can take your time tying your kid’s shoes or digging through your bags to find your keys. With open cubbies and hooks, you’ll easily eliminate clutter that accumulates by the door. Need a place to get some serious work done without distraction? The desk nook at Reserve at City Center has you covered! Sitting opposite the sunroom, you’ll get plenty of natural light to inspire you and get the exclusion you need to concentrate. Another working alcove is the decorative wet bar found at 28th at Brookwood. 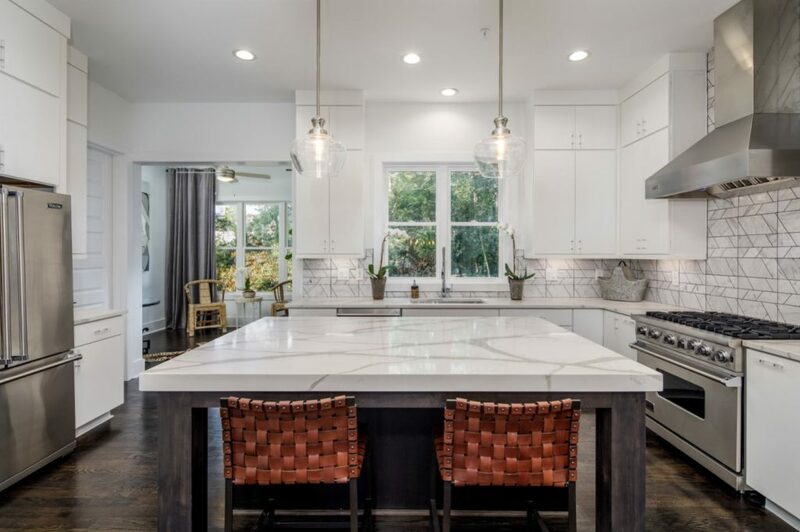 With an accent tile wall, floating shelves and the perfect amount of storage, you can host a small cocktail hour on your top floor without going up and down to the kitchen. Enjoy music or a movie and a nightcap after the kids go to bed or enjoy a glass of wine as you take in your city views. The sunny sitting area in Cosmopolitan’s bedroom leaves open ways to maximize your space. Whether you fill it with a comfortable chair, a vanity or workout equipment, you’ll love having a private space of your own in your bedroom. While having extra places to sit is nice, having fewer items taking up open space is also appealing. In the kitchen at Long Island Parc, there is a space for every piece of kitchenware and more. Deep drawers, large cabinets, and decorative window cabinets. You can organize your cookware AND showcase your delicate pieces in a safe spot. What’s more is they help keep your kitchen bright and your countertops clear! 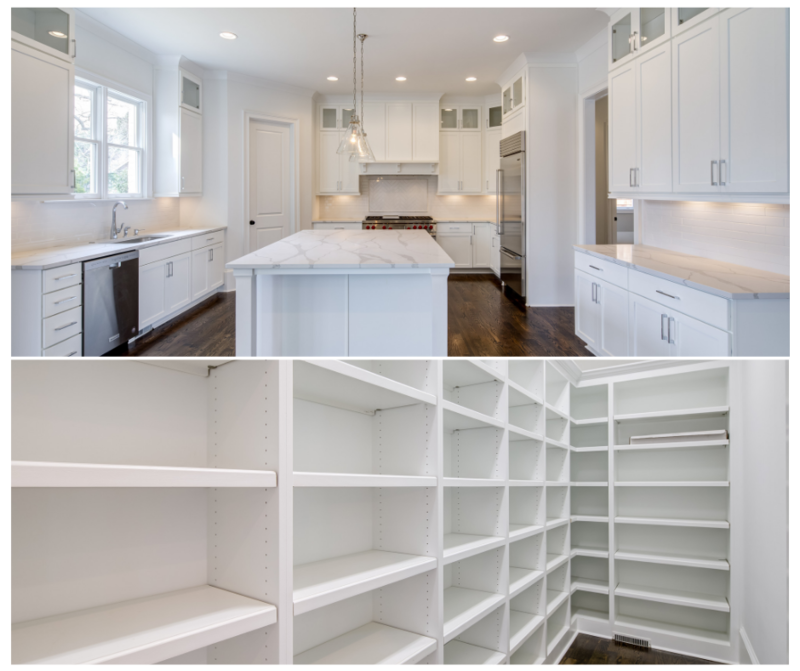 In addition to the endless cabinet storage, your pantry is a customizable space where you can keep kids’ snacks at a friendly level and all your cooking ingredients where they work best for you. Keep your dog food enclosed or your cleaning supplies out of reach, it’s all up to you. 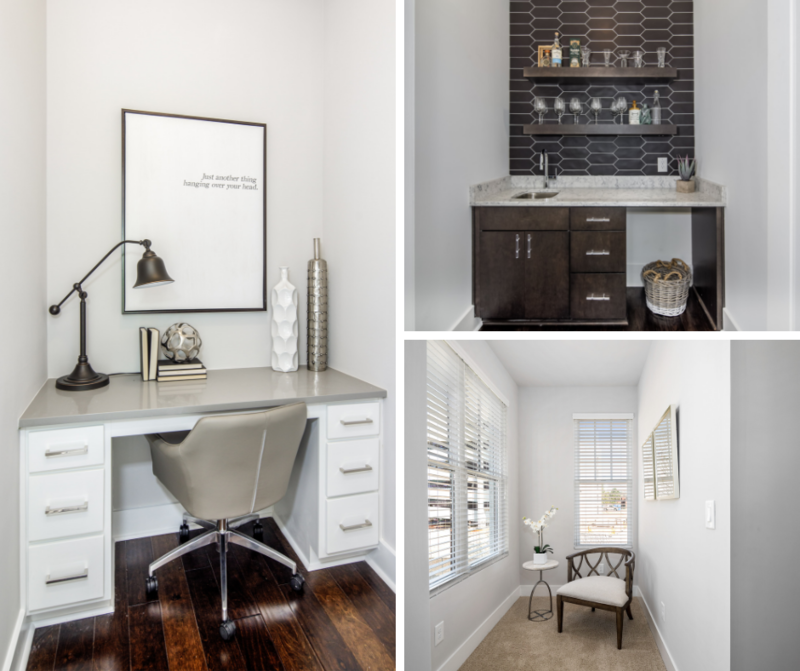 When you move into your new Rockhaven home, you’ll want to maximize space and get organized. We hope we’ve inspired you to keep it that way. From sunrooms to storage, we’re here to help maximize your space and love where you live! All of our homes feature endless opportunities to spark lots of joy as you enjoy every inch of your new home. Contact us today to take a tour of the spaces above.